This morning I woke up at 7:30 to hear David Bowie’s iconic song Starman playing on the radio, followed by the news that he had passed away after an 18 month fight with cancer. David Bowie was a chameleon who seemed to anticipate the future, and the chances are that the first time you knew about a new trend was because Bowie was at the forefront of it. For some people it was seeing David Bowie and the Spiders From Mars performing Starman on Top of The Pops in 1972 that changed their lives. For others like me it was Ashes to Ashes the sequel to Space Oddity, which had an iconic video that pushed video technology to new limits and even showed of a device that we now know is an iPad. Bowie was quick to embrace new fashions, musical styles and most importantly technology where he was innovating and doing things that were way ahead of its time. In 1983 during his Serious Moonlight tour he sent his first email, and at that time most of us had probably never heard of email. In 1994 when he released Jump They Say, he saw the potential of CD-ROM technology, and allowed fans to create their own video for the song. The CD-ROM he released allowed fans to edit your own “Jump They Say” video, mix your own version of the music, or explore a virtual world of hidden animations, sounds, pictures and other surprises. The CD-ROM also contained four videos from the album and interview clips. If you played the CD-ROM on a Macintosh computer, the studio area had an 8 track mixing desk, and by leaving the studio area and re-entering three times you found that you were offered the choice of mixing four songs rather than just one. During the writing of his album Outside, he used a specially created piece of Apple Mac software called Verbasizer. The software allowed him to type in dozens of sentences which were then randomly selected, and slammed into each other to create new lyrics. These new lyrics were used by Bowie as a source of inspiration. Downloading music online is something that we now take for granted but back in 1996 Bowie released Telling Lies on his website as a downloadable song, months before he physically released it as a single. Nowadays you can watch live concerts streamed live via YouTube but back in 1997 Bowie attempted to broadcast a concert, sadly bandwidth limitations let him down. In 1997 Bowie created something that today we take for granted. He created Bowie Bonds, which allowed him to sell future earnings on his catalogue resulting in him becoming his own tech venture capitalist. By reselling and reinvesting himself to generate enough cash to buy songs owned by his former manager and to also help setup his Internet Company Ultrastar which launched BowieNet his own ISP (Internet Service Provider). BowieNet was initially launched in the US and offered subscribers access for $19.95 a month in the US. It was later launched in the UK, and Bowie added in lots of goodies, including twenty megabytes of free space to build a simple website, an email address with the davidbowie.co.uk domain name, and access to live chat sessions with Bowie himself and various musical collaborators. BowieNet was officially closed in March 2012 but in reality it had been closed since 2006 but before it closed he experimented with technology that is now in everyday use. An internet radio with Bowie as a DJ, music and video files that were encrypted to prevent privacy, live concert streams as the bandwidth and technology had improved since his previous attempt at live streaming. Before Second Life existed there was BowieWorld and it allowed users to interact using 3-D avatars. He also launched a cyber song contest that crowdsourced lyrics to a half-finished song Bowie had written. Bowie also found time to portray another tech pioneer Nikola Tesla in Christopher Nolan’s 2006 film The Prestige. In 2013 Bowie launched the album the Next Day quietly via Social Media and it became a global best seller. Bowie had realised the potential of using social media to promote your products. His current album Blackstar was released three days ago along with another stunning video and single Lazarus, which we now know is his swansong. Before musicians like Bono became tech entrepreneurs there was David Bowie and he not only left behind his legacy of great music but also he paved the way for how musicians use technology. Bowie was iTunes before iTunes, YouTube before YouTube and he also gave us the chance to fully immerse ourselves in his audio and video offerings. R.I.P. 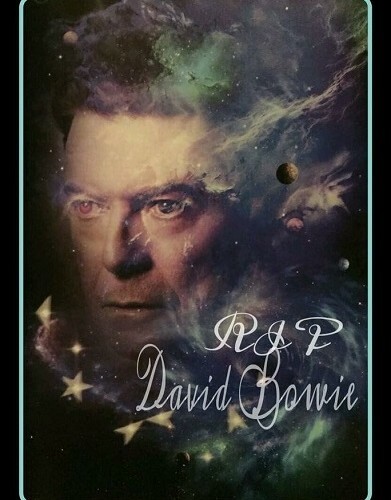 David Bowie, Music and tech fans salute all your innovations.